It's been a busy week. Over at Brush Dance, we are looking at so much art for 2016 calendars (yes, already), selling so many 2015 calendars (yes, already), and talking about lots of new projects. And here's what's going on with in fountain pens . . . I received my Cube from Mike Dudek of The Clicky Post and Dudek Modern Goods. I ordered the least expensive item on his page - you know, just in case. You guys, it's pretty incredible. 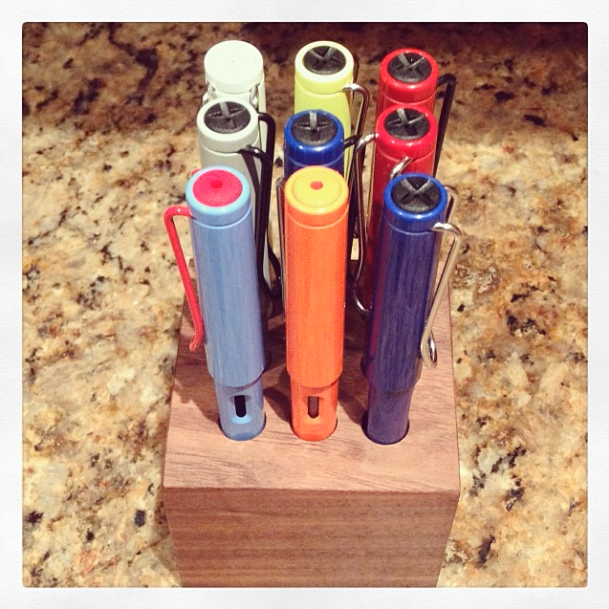 As you can see from the photo above, Lamy Safari fit perfectly. I was a little worried that the inside of the openings would be a too rough to trust that they wouldn't scratch my collection, but that is not the case at all. The Cube feels weighty, solid in your hands and it's perfectly smooth - perfectly perfect. Well, there is one tiny small issue - I actually bought this as a gift for Mr. Pentulant (who only dabbles in fountain pens, but needed a safe place to keep the few that he owns I let him borrow), and now The Cube is on my desk. I have no affiliation with Dudek Modern Goods other than a sincere admiration for what he does. Pen Addict reviewed the Retro 51 Tornado Black Fountain Pen. I don't think this one will make it to my wish list. The Well-Appointed Desk dressed the part for Handwriting Day. I might be jealous. Gourmet Pens didn't have anything to say about Akkerman Hofkwartier Groen. Inkdependence reviews Namiki Blue. You like? Oh..and, finally, I changed my name over on Instagram. I'm Pentulant there now, too, because that's how I roll.